For clients with multiple business locations, a remote sales force or office staff needing access to up to date documents and artwork templates, Burst Digital offers a dynamic solution that allows you to order business printing online through your own secure storefront. With our online print ordering solution you have the ability to access, create, edit and print your latest marketing materials or documents quickly and efficiently; including everything from Business Cards to Roller Banners, Giant posters to hanging POS displays. It helps maintain brand consistency, prevents costly mistakes, and allows you to order your print materials instantly with a minimal amount of fuss. So the next time you send 6 emails and spend over 2 hours searching for, updating and ordering a simple set of business cards remember; you could have your own branded storefront with your entire range of marketing material ready and waiting. So what is Coffee Stop? 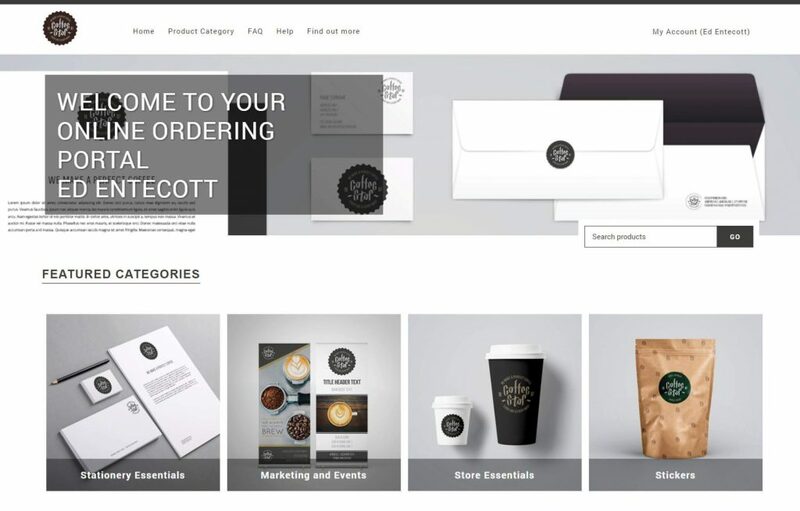 Coffee Stop is a fictional coffee chain we have developed to show off the benefits and functions of our online print ordering system. The demo site allows you and your colleagues to self-register and fully test the various product configurations and capabilities ahead of implementing within your own business or marketing team. Individual store managers can log on to one central location where only the correct versions of approved materials can be ordered. This means marketing managers can sleep easy at night safe in the knowledge that their brand is safe and nobody is ordering that business card design from 1997. Store managers are happy that they can easily order items out of hours without the hassles of going back and forth with head office about a simple set of store-cards. Even the accounts team is happy because they receive an itemised list of spending each month against valid purchase order references. Finally, you shouldn’t have any issues with people ordering the wrong item or not including the correct partner logo because you can easily set up approval workflows allowing checks to be made by appointed people before orders are sent for production. Don’t be fooled by the simplicity of a coffee store using the system, we have customers in both the pharmaceutical and defence industries using this to help their organisations function better. This is the really simple stuff that doesn’t require editing/changing on a regular basis like Headed Paper or Promotional Pens. For these items you simply select the product, quantity and delivery address and we process the order. In order to achieve greater savings we can hold a stock of your items within our secure warehouse and process orders as you need them, when stock falls below a certain level we will produce more for you automatically. This is where the real benefits of the system are found. There’s a few ways to handle editable products so we have given an example of each below. These are products that can be edited with strict limitations set by you to prevent users from ordering the wrong thing. We’ve used the example of a store card which can be ordered by individual store managers. You don’t want them to be able to change the layout, font types, sizes, colours or logo so they are simply able to select their location from a drop down menu which automatically inputs their address and contact details. If a new store is added, or contact details need amending this is done at an admin level making it impossible to order incorrect items. Using an employee business card as an example, this time the key elements of the design are locked down, but the individual details are inputted in the required columns. This is great for items that can’t be handled with a simple drop down list but you still want to keep control of your branding and what elements can be edited. Currently paying for artwork amends, or employing designers to carry out relatively simple tasks? This feature allows unskilled workers to make simple amendments themselves without having to use costly design software and free’s up your skilled designers to work on more beneficial projects. As will all products on our web-to-print system, approval processes can be setup so that all designs are checked and approved prior to printing. Using the systems built-in online editor you can design and layout a vast range of documents without having design software stored locally on your PC; meaning you edit, create and order print runs from anywhere at any time. As with the previous product types you can still lock down settings and image libraries, the real difference is the flexibility that the editor gives you. For demonstration purposes we’ve used a pull up banner, which would usually require professional design. 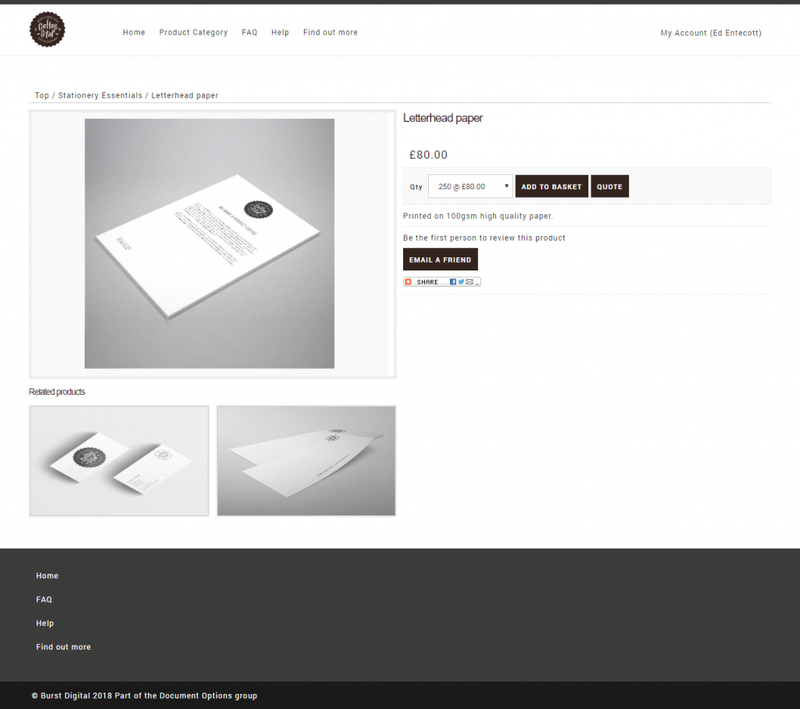 You can drag and drop pre-approved images, upload your own images and change the text before approving the design for print. Once you’ve finished editing your products you simply add them to the basket and place the order. 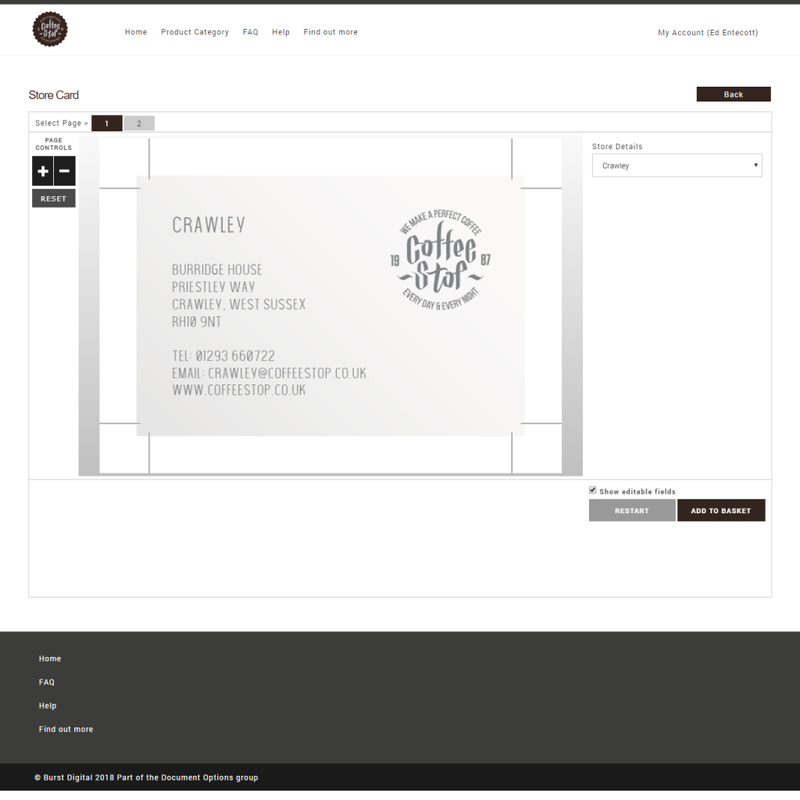 Orders can be purchased by card or using Purchase Orders that are billed to your accounts team, notifications are sent out letting you know the status of the order and confirming once it has been shipped to your chosen destination. Order business printing online – what are the benefits? Time Saving – It is estimated that on average, a marketer or creative will spend an hour a day fielding requests or searching for files. This is valuable time that could be spent on the more important business activities that will actually make money. Additionally, these inefficiencies can be detrimental to time-sensitive projects and deadlines. Order business printing online and you could save time. Efficiency – Web-to-print software drastically improves efficiency by keeping all valuable media files accessible. Therefore, the routine task of managing large collections of assets is taken care of. Order business printing online and you could increase efficiency. Save Money – One of the biggest expenses relating to the production of assets is the use of a graphic designer. 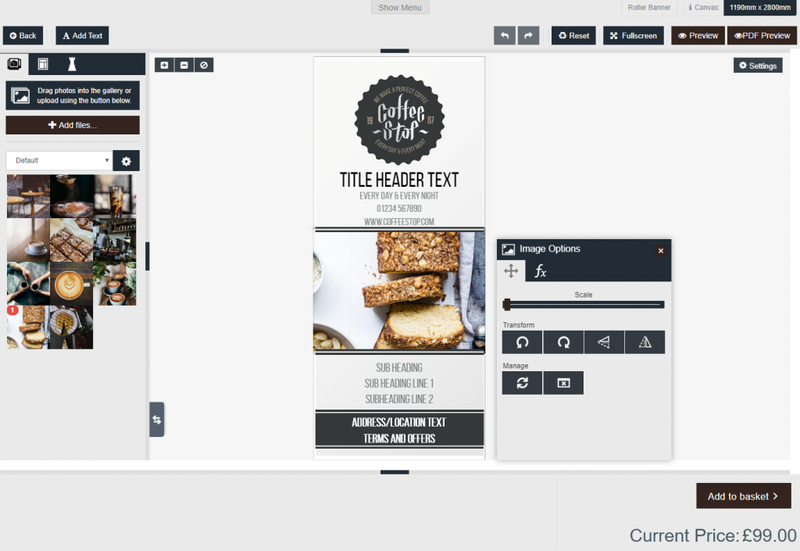 Brand Centurion makes it easier to edit pre-approved templates and re-purpose files. This is a much better use of resource then creating an asset from scratch. Additionally, it provides a secure storage system for all assets so organisations don’t waste money repurchasing licensed files. Order business printing online and you could save money. Reduced Errors – One of the biggest headaches related to marketing and branding is employees not sticking to brand guidelines. With a brand asset management portal, this headache can be alleviated as employees will only be able to work from pre-approved templates. Order business printing online and you could reduce errors. Ready to order business printing online? Email Dan Patience on dan@burstdigital.co.uk or call 01293 660722.